Just in time for TC Pride, Minneapolis has a cutting edge digital guide to local LGBTQ history. 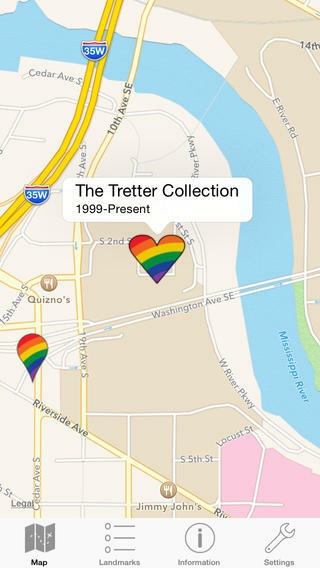 YesterQueer shows local queer history sites on a contemporary map. But its creators see this content as only the beginning. Please download the app. And then share additional memories and images of LGBTQ history via email: yesterqueer.tc@appynerds.com. YesterQueer comes out of a collaboration of the Jean-Nickolaus Tretter Collection at the University of Minnesota, Twin Cities Pride, author and activist Stewart Van Cleve (Historyapolis contributor and author of Land of 10,000 Loves) and Kerem San, founder of AppyNerds Mobile App Studio. This entry was posted in Stories and tagged gender and sexuality, TC pride.